The late "Star Trek" actor Leonard Nimoy, who died in February 2015, is the subject of a new film directed by his son, Adam, which is called "For the Love of Spock." Like many people, Adam Nimoy has loved Mr. Spock from "Star Trek" since childhood. But Adam Nimoy's feelings run deeper, and are more complicated than yours or mine. Spock was played by Adam Nimoy's dad, Leonard Nimoy, who died of a pulmonary disorder in 2015 at the age of 83. "Spock resonated with so many people on so many levels," Adam Nimoy told Space.com. Spock's appeal, Adam Nimoy added, derives partly from the character's status "as an outsider on the [starship] Enterprise [who] tried to keep complete control of his emotions, which many of us aspire to do." Spock was also a scientist, and his profession helped inspire many people to pursue careers in science, technology, engineering and math — including a number of folks who ended up working at NASA, Adam Nimoy said. For The Love Of Spock Teaser from 455 Films on Vimeo. "For the Love of Spock" is a documentary about the life of Leonard Nimoy, Spock on "Star Trek," funded by fans through Kickstarter. Adam Nimoy said he has fond memories of watching "Star Trek" when the original TV series first aired, in the 1960s. But his father's celebrity eventually became a bit much for the younger Nimoy. So Adam Nimoy moved on, went off to college and stopped watching TV. "Star Trek" was coming back, first with movies and then as a franchise that spawned multiple spin-off TV series, fan tributes and comic conventions. The movie series was re-booted in 2009, featuring a new Spock played by Zachary Quinto, and another film hit theaters in 2013. Leonard Nimoy appeared in both of these movies (as an alternate-universe version of Spock) and publicly expressed support for Quinto; the two actors even did a car commercial together that poked fun at aspects of Spock's personality. And the "Star Trek" renaissance goes on: Another film, "Star Trek Beyond," will hit theaters this July, 50 years after the original TV series debuted. Leonard Nimoy was always "artistically hungry," Adam Nimoy said. One famous example was Leonard Nimoy's request to direct "Star Trek III: The Search for Spock" (1984). The actor appears onscreen only at the very end of the film, so it was somewhat easier to manage being an actor and director at the same time, his son said. But the elder Nimoy's decision to also direct "Star Trek IV: The Voyage Home" (1986) made the actor's life "very challenging," Adam Nimoy said. "He had to be on camera and behind the camera … he was sick a lot when making that film," Adam Nimoy explained. But the result was a film that, to this day, is beloved by many "Star Trek" fans due to its (and Leonard Nimoy's) sense of humor. Adam Nimoy said one particular scene in "Star Trek IV" — which showed Spock neck-pinching a punk blasting music on a city bus — remains one of his all-time movie favorites. 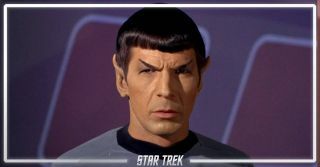 Spock's evolution is shown throughout the documentary with a variety of classic episode clips, family pictures and interviews with key Hollywood players who worked with Leonard Nimoy. Quinto and many other actors from the newest iteration of "Star Trek" films are interviewed in "For the Love of Spock," as are cast members from Leonard Nimoy's era, including William Shatner, George Takei and Nichelle Nichols. Astrophysicist and science popularizer Neil deGrasse Tyson also makes an appearance.